The world’s most expensive spice, saffron, is produced by the saffron crocus, Crocus sativus. This intriguing and lovely flower’s story is intertwined with a human history that spans no less than 3000 years. In truth, it does not exist naturally anywhere, but rather is a sterile triploid cultivated through the centuries for its deep orange-red style and stigmata – the only part of the plant that is used to make the spice saffron. In addition, it is a welcome plant to any garden that meets its basic needs. Growing saffron crocus is easy and certainly makes the expensive spice much more affordable. A step-by-step guide for anyone who wants to grow saffron! The Crocus Sativus is an autumn flowering plant, so the best time for planting is from July till early Autumn, depending on your area. Plant the bulbs about 5cm (2 inches) deep, preferably in full sun (or somewhere that will be sunny during the autumn/fall flowering period). The soil should be rich, faily sandy, and most importantly well-drained. Don’t over water them or they will succumb to fungal diseases. They’re very drought hardy and will probably only need watering once or twice during their growing season. 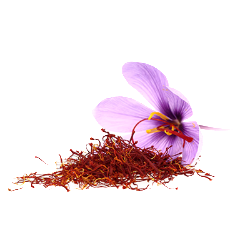 Saffron produces flowers in autumn/fall with a beautiful light purple flower, which lasts a few weeks. The leaves only appear after flowering. The first harvest should be gained within 8 to 10 weeks. When the flowers are fully opened, you can carefully remove the stigmas from the flowers using tweezers, or harvest the whole flower if you have a bigger crop. Harvesting the flowers is real back-breaking work as the plants are very small. Then there’s the delicate operation to remove the 3 dark red stigmas from each flower – the flower is then discarded as it has no commercial value. Dry the stigmas in a dehydrator or on a fine mesh rack in a cool oven (50-60 degrees C) for about 15 minutes. Store saffron in an air-tight container in a dark place. However you will need a couple of hundred plants to get your 1 gram of saffron threads!